A General Dynamics business unit and its partners will move to the second phase of development an active protection system for the U.S. Army’s Bradley Fighting Vehicles. 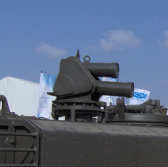 A team of General Dynamics Ordnance and Tactical Systems, Elbit Systems and IMI received positive feedback from the Army Requirements Oversight Council for the Iron Fist Light APS, the Falls Church, Va.-based defense contractor said Wednesday. Iron Fist Light uses optical sensors, launchers, countermeasure munitions and tracking radar to protect combat vehicles from threats in urban and open terrain environments. Steve Elgin, vice president and general manager of armament and platform systems at GD-OTS, said the industry team is excited to transition to phase II to facilitate the integration of the Iron Fist Light platform into Bradley vehicles. “We look forward to continuing to partner with the Army on advancing this important technology as well as enhancing integration capabilities across multiple Army platforms,” Elgin added.